Rory Vaden is a self-discipline strategist, cofounder of the international training company Southwestern Consulting, and a New York Times bestselling author. As an author and business motivational speaker, Rory’s unique insights have been shared on Oprah Radio, as well as in Businessweek, Publishers Weekly, and Success magazine. 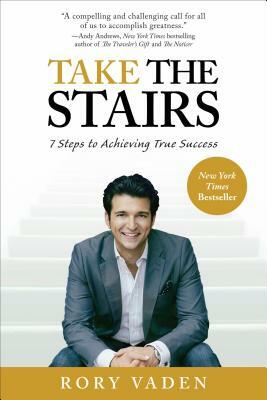 He is the author of Take the Stairs: 7 Steps to Achieving True Success. "I always say that personal finance is only 20% head knowledge and 80% behavior. Behavior change is hard, because it requires something a lot of people are missing these days: self-discipline. If you want to make a change in your money, business, or relationships, do not miss Take the Stairs. It gives you the tools you need to take control of the only person holding you back: yourself." "This book won't let you off easy-and that's why it's great. Rory Vaden gives readers what they need to get focused and tackle problems head on- and win." "This book shows how to develop the courage, character, and determination to succeed in anything you attempt. It can change your life!" "Take the Stairs is a compelling and challenging call for all of us to accomplish greatness. It not only shows you how to make self- discipline more sustainable, it will reignite your passion to achieve." "A gem of a book that will inspire you to do the little extra things that make a huge difference. Buy it!" "If there is one book to read this year, this might be it. It's at the core of everything. Brilliant. Significant. Necessary." —Roxanne Emmerich, bestselling author of Thank God It's Monday! "Motivating yourself is a key to success in all of life. Read this book and your fighting spirit will come alive!" "Don't be fooled. There is no escalator to the top. This book will tell you the truth about what it really takes to become a massive success in every area of your life-if you choose to Take the Stairs." "The easy way is never the excellent way. For get rich quick or wish upon a star, go elsewhere. For an agenda for excellence, read this book. Rory gets it." "This isn't a book of cheerleading and motivational platitudes. This is the book that can change your life. I highly recommend it to anyone who is looking to take quality of work and life to a higher level." "Do you have a career worth loving? Rory Vaden will give you the ideas, insight, and inspiration to create a career worthy of your greatest potential." "Rory's Take the Stairs book is an encouraging message of hope and truth that can really help you improve your life. Read it as soon as possible!" "Pure and simple, this should be the only book on the shelf in this category-because it's the only proven way to achieve authentic, sustainable success. Buy this book and heed this message!" —David Avrin, author of It's Not Who You Know - It's Who Knows YOU! "Take the Stairs identifies the specific strategies that will help you get past procrastination and fear to accomplish anything you desire." "You can't spend 30 seconds around Rory without getting inspired to change your life. You're about to spend a few hours with him. Get ready."